Potterierei 15, 8000 Bruges, Belgium. 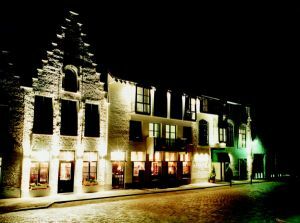 This Bruges hotel is located along one of the most beautiful and major canal of Bruges, within 5 minutes walking distance from the main Market Square of Bruges and within 10 minutes driving distance from the central station of Bruges, the hotel is easily accessible by public transport as well as by car. The hotel also has it’s own underground car park with a capacity of 35 spaces. All 101 comfortable air-conditioned hotelrooms including 4 suites are equipped with bathroom, TV with 4 channels in-house movies, radio, IDD telephone, WLAN Internet-connections, private safe box, minibar and hairdryer. The hotel is also equipped with rooms for guest with disabilities as well as non-smoking rooms. 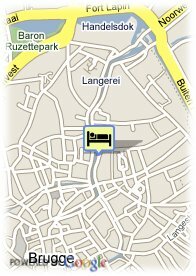 For those who wants to relax after a busy day in Bruges, the hotel has a fully equipped health centre. The hotel is located along one of the most romantic & major canals of Bruges within 5 minutes walking distance from the main Market Square, shopping area, museums and touristic attractions.